Nothing much to see here! A quick weekend afternoon hack. The ebike power supply died, so time to knock up a cable to charge the battery from a variable power supply. 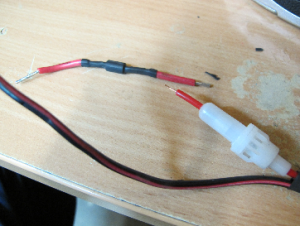 A 3-pin XLR socket, a fuse holder with a 5A fuse and a diode for reverse current protection. A bit of soldering and heatshrink and we’re up and running. Checked it out. Set the power supply to 60v (same as the old charger) with 3A current limit, and we’re charging ok. This was written by gary. Posted on Tuesday, August 9, 2016, at 7:00 am. Filed under Project, Uncategorized. Bookmark the permalink. Follow comments here with the RSS feed. Post a comment or leave a trackback.